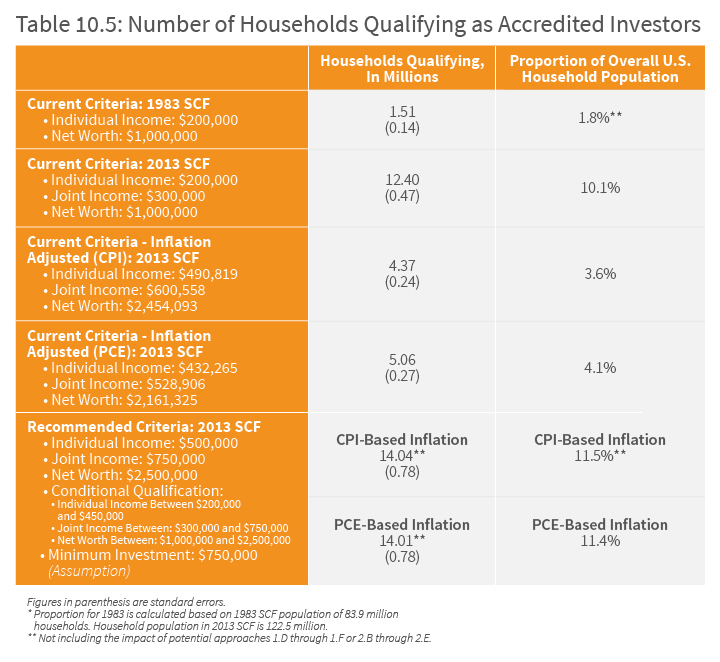 Who is Considered to be an Accredited Investor? In the world of private placements under Regulation D, there are many questions that must be asked in the process of conducting a successful offering. However, one question rises above the rest: “Is the investor an accredited investor?” Answer yes, and the investor may enter the offering. Answer no, and the investor is likely sent packing. So, what is an "accredited investor" exactly? As of 2013, 10.1% of U.S. households fall into the category of having a net worth of $1,000,000, excluding their primary residence. Under Reg D, there are several categories of accredited investors. While all of these are laid out in the rule, in particular 17 C.F.R. 230.501, most individuals who invest in a Regulation D offering accredit via income or net worth (the “Financial Thresholds”). Under the current rule, to accredit via income, an investor must have an annual income of $200,000 (or $300,000 if filing jointly with a spouse) within each of the last two years. To accredit via net worth, an investor must have a net worth of $1,000,000 excluding their primary residence. As of 2013, 10.1% of U.S. households fall into this category.1 The problem is that these thresholds were set in in the 1980s, when only 1.8% of households met these tests. The thresholds have not been adjusted since then. First, it is important to note that the SEC has only made recommendations at this point. They are not proposed rules. That being said, these recommendations break down into two groups: revising the financial thresholds and relying upon other measures of sophistication. You can read more about our recommendation to the SEC in this blog post. The Commission made several recommendations for revising the financial thresholds. The first proposal is to leave the current income and net worth thresholds in place, subject to investment limitations. Such limitations include limiting any investment to 10% of prior year income or net worth per issuer, in any 12-month period.2 As the Commission has yet to determine what this limit would be, we are unable to really pass judgment, but we do have concerns about the 10% limit that the staff recommended. In particular, in our experience here at WealthForge, it is far harder than it may appear to calculate thresholds such as the one proposed. The question of what gets counted without concrete guidance becomes a subjective question that regulators may choose to argue. Additionally, there is no way to ensure that the investor will provide all of the relevant information to the issuer or broker-dealer, meaning the issuer or broker-dealer could make the determination that the limit has not been met based upon incomplete information. A worst case scenario is that if this fact comes to life after a 506(c) offering is completed, it could cause an offering to lose its exemption from registration triggering a violation of Section 5 of the Securities Act. Additionally, the SEC considers companies under common control to be the same issuer, such as separate Special Purpose Vehicles used by a fund or similar companies. Our experience has shown that these type of issuers have many investors who invest in multiple offerings. Under this definition of “issuer”, these investors would effectively be shut out of the market, significantly hindering an issuers’ ability to raise capital. This would be a major blow to the Regulation D market. From the murky investment limitation standard to the effect on serial issuers, the first proposal has many issues. It appears to be designed to shrink the size of the Regulation D market and could potentially shut investors out of the marketplace. This runs counter to the purpose of the JOBS Act, which is focused on providing more access to capital for issuers and better investment opportunities to investors. As a result, WealthForge believes that the Commission should not attach investment limitations to the current standards. Another proposal is to increase the thresholds by adjusting them for the amount of inflation since they went into effect in the 1980s. The staff recommended the following new thresholds: $500,000 for individual income; $750,000 for joint income; and $2.5 million for net worth. These thresholds would not be subject to the limitations discussed above.3 Ultimately, this would decrease the accredited investor population from 10.1% to around 3.6% and from 12.4 million households to 4.37 million.4 This drastically decreases the available market for private placements, slowing the growth of the many companies that rely upon Regulation D for capital. WealthForge sees any attempt to apply this change, as again, running counter to the purposes of the JOBS Act. The Staff seemed to indicate that its preferred approach is for the Commission to use all three of these, in addition to using other measures of sophistication discussed below.7 They argue that the use of multiple financial thresholds, plus the addition of the minimum investment threshold, would increase the accredited investor population slightly while maintaining the goal of investor protection. The Staff also made several recommendations for including other measures of sophistication. First, the Staff recommends that the Commission permit individuals with a minimum amount of investments, likely $750,000, to qualify as accredited investors.8 This would probably not have a major effect as many, if not most, of these individuals already qualify as accredited investors through either net worth or income. Nevertheless, this could widen the net to include some individuals with significant investment experience, especially if the financial thresholds are increased to account for thirty years of inflation. Second, the Staff recommends that the Commission consider extending the definition to include professionals with certain designations, in particular, individuals who have passed the following financial exams: either the Series 7, Series 65, or Series 82.9 The assumption with this recommendation is that by passing one of those exams and working in the financial industry, an individual shows a sophisticated knowledge of investments, particularly investments in private placements. While that may or may not be true for each individual, we support the idea of having an objective standard to determine sophistication. The third approach would be to expand the definition to include “knowledgeable employees of private funds.”10 The thought here is that “knowledgeable” employees of private funds, as defined in Rule 3c-5 of the Investment Company Act, have significant investment experience and access to information to make informed decisions. We do not see this as a beneficial change. Rule 3c-5’s definition includes executives and directors of investment companies, most of whom already are accredited — especially if the offering is of their own securities — and employees who “in connection with his or her regular functions or duties, participates in the investment activities of [the investment company].”11 This test appears to be too subjective for us to feel comfortable with it, especially in light of the previous suggestion that involved passing an objective test. This prompts the question of how a broker-dealer or issuer would verify that an individual is accredited via this method in a 506(c) generally solicited offering. A business card? A LinkedIn profile? How does one determine what functions are regularly performed by an individual versus what functions are intermittent? These are the types of questions that can lead to regulators knocking at the door. Additionally, this category covers a very small population of individuals who are not already accredited and thus would not expand the accredited investor pool significantly. 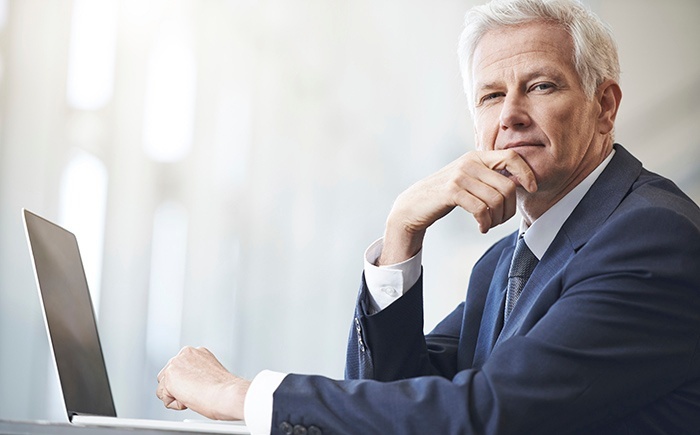 An accredited investor exam is a concrete and objective standard that allows issuers and broker-dealers to determine the accreditation status of an individual in an efficient manner. The Staff also suggested the possibility of an accredited investor exam.12 This option has the possibility of expanding the accredited investor pool significantly, resulting in people who have never had access to the private market having access for the first time. We like the idea of an investor passing a test as it is a concrete and objective standard that allows issuers and broker-dealers to determine the accreditation status of an individual in an efficient manner. To aid in this, WealthForge hopes that upon passing an accredited investor test, the investor would be granted some sort of evidence of their passing. A card, an electronic certificate, or some other document that the investor can provide showing their status as an accredited investor would be necessary for this approach to work. Some issuers may worry that allowing anyone, regardless of his or her financial situation, to become qualified to invest in private placement will lead to a higher likelihood of litigation between issuers and investors. While this is always a possibility, we believe the likelihood increases with investors who have a greater need for liquidity due to a lack of assets. This is the reason that broker-dealers are required to conduct a suitability analysis, which includes reviewing a litany of factors, such as liquidity needs, investment goals, etc. If an investment is unsuitable, the broker-dealer may choose not to allow the investment to proceed. This is one of the many ways that working with a broker-dealer protects an issuer. Also, an issuer can always reject a potential investor for any reason. One last suggestion that the Staff made was that no matter what options the Commission goes with, all investors who have invested under the current definitions should be grandfathered into the new definition. We support this suggestion and anticipate that whatever the Commission decides to do, that current investors will be grandfathered in. Increase Your Potential for Success Series: Does Your Offering Have a Compelling Structure? Chris serves as Associate Corporate Counsel at WealthForge where he advises on an array of areas, including both federal and state securities laws, broker-dealer law, general corporate law matters, and cybersecurity.